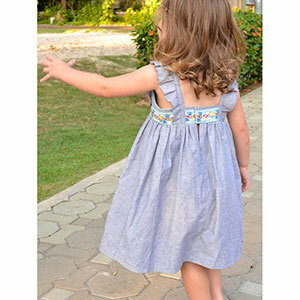 The Edelweiss Dress is a cute, breezy sundress with an empire bodice and ruffled straps. It comes with an option for a pieced bodice, so you can feature a beloved fabric, vintage hanky, piece of embroidery, or anything you'd like in the central panel. It also comes with a tunic length option that pairs perfectly with leggings, shorts, or pants. 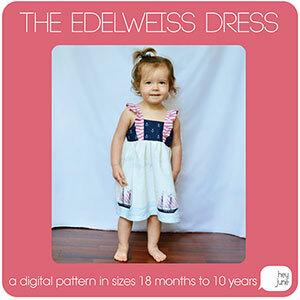 This pattern is available in sizes 18 months through 10 years. 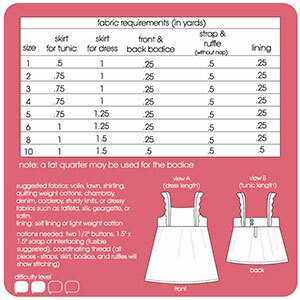 Suggested fabrics are light to mid weight wovens such as crepe de chine, rayon challis or peach skin or a stable knit such as ponte de roma or cotton lycra.